I just want to take this time to say thank you for all your support during this time of my life. For every email and words of encouragement that you shared with me has been a blessing. For every letter, signed petition, or sharing my story one FB. For taking the time to study my case and write my story. For being my voice when I couldn’t speak. Just for believing that I deserved another chance at life. Thank you. Thank you for allowing me into your life, helping make my time easier. As you know I will be leaving Tuesday 6:00am. I am expecting my family and friends to be waiting for me at the gate. What an exciting time this is going to be. I have waited for this moment for 21 years to reunited with my family. I don’t know why God has allowed me to do 21 years of basic training nor what I will be blessed to use it for? I am just grateful that He never left me to do it alone. There were days that I thought that I couldn’t or wouldn’t make it, but I did. I know now that the hardest times was when God was right there every step of the way, sometimes carrying me. Losing members of my family were times I didn’t think that I could make it. It’s been said that God won’t put more on you than you can bare. I will be honest and say that there were moments that I just didn’t understand those words. I thought that if I lost one more person I would break. It is by God’s grace that I am still standing. From the lost of my parents, brother, aunts, God-parents, other family members that impacted my life, and friends it was hard. All but of my elders are gone but one. I eventually realize that with each lost I was able to deal with it because of what they had given me in life, fond memories, and lots of laughter! The hardest part of this journey was not being able to raise my sons. As a mother the thought of having to leave my sons and not be able to tell them WHEN I was coming home was very difficult. Then to call home to have one is sick or the other dealing with a situation and have them say ” mommy please come home”? Or have them ask mommy when are you coming home and not be able to give an answer. Countless nights I fell asleep on a wet pillow from my tears asking God when? Not once giving into the Life sentence. I didn’t allow this to be a missed opportunity I did my best to school the young women about poor relationships and the important of maintaing a good relationship with their children. So for many this will be my last email on this side. My email and phone will be shut down on Monday. I promise that I will keep in touch. Prison Conduct: No incidents in 20 years – role model inmate. Clemency: Attorney assigned through Clemency Project 2014. Petition has been submitted. 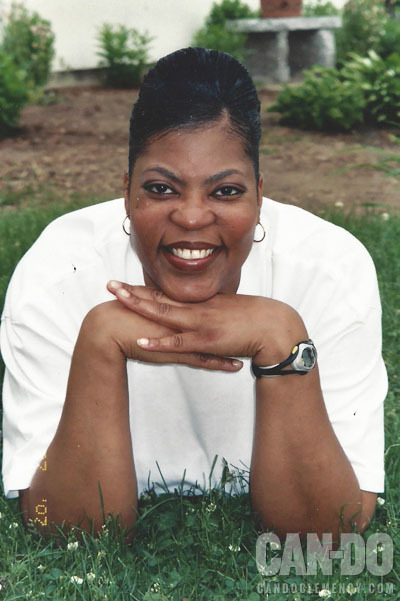 I am a first time non-violent offender serving life in prison. I was charged with Conspiracy to Possess with the Intent to Distribute Cocaine and Cocaine base. In court there were no drugs presented to the jury – it was based solely on hearsay and “ghost dope,” a term we use for cases that are based on testimony alone. My Judge stated he wasn’t going to sentence me for the totality of the conspiracy; only from the time I met my co-defendant, since that is when I technically entered the conspiracy, however, I ended up with the whole amount. He also stated that I didn’t deserve a life sentence but that he was mandated by law to use a chart and based on the guidelines, he had no other choice. Based on new case law, Apprendi and Cotton, if I were tried today I would not get a LIFE sentence because the government now has to establish drug amounts, prior to the trial. Plus, the Judge can now use his or her own judgement during the sentencing phase. I won an issue on direct appeal, the sentence was thrown out and I was remanded back to court to be re-sentenced. The Judge stated again that he felt that I didn’t deserve to spend the rest of my life in prison and asked the government to depart from the sentence, but the prosecutor refused, so my Life sentence was upheld. Today a lot of factors would have caused me to receive a lesser sentence such as having a drug quantity in my indictment. When I arrived in prison I was down, lonely, co-dependent and felt helpless. This has been a very long and hard road that I’ve been on for the past twenty years. Today I am empowered with knowledge, I am wiser, stronger mentally, and physical, independent, and ready to become a productive member of society. I know that I can be, because of the connection that I have made with organizations that have assisted my sons when they were in need. My only run in with the law was driving too fast and once, I was driving without a license. I never thought that by traveling with my children’s father during his drug buys or answering the phone and conveying a message would land me in prison for the rest of my life. That is what happens when your sentenced to a conspiracy charge. I even left him and moved back to New York after he struck me. He got help, begged, traveled to see me almost every weekend and promised my family he would never hit me again. I returned to live with him in Charlotte and regret that decision, as it cost me my life. Although prison has allowed me to truly understand myself, the reasons why I used drugs and my involvement with someone that sold drugs. To understand the importance of my minor role in the conspiracy that was major in the lives of those that purchased the drugs does not take a LIFE time to learn. I saw the error of my way in a flash, and do not believe it takes more than a couple of years to pay for my wrongful behavior. I’ve done everything possible to educate myself to becoming the woman that can make a difference upon my return to society. My first accomplishment was to complete RDAP. I’ve obtain many skills since I’ve been incarcerated. Apprenticeship’s in Office Administration Assistance, and Chaplain Assistance. Certificate with college credits in Business with Legal application. Certificate in Wedding Consultant, along with numerous other certificates. I have programmed during my entire twenty years. My work has left no time to get into trouble. I have received NO incident reports during this time, not one write up. I have been considered by some staff to be a model inmate that afforded me the opportunity to speak with the women that came into the prison showing that you can make the best of a bad situation if you put your mind to it. I also assisted the Warden with her program Random Acts of Kindness, the Chaplain and the Recreation Department with programs. I have two children Dwight and DaJon. They were three and four years old when I was arrested and are now twenty-three and twenty- four. Dwight my oldest is going to be a father for the first time in February, and DaJon is the father of my first grandchild Sabrina. I missed watching them grow up and now I am missing out on the birth of my grandchildren. My father was sick before I came to prison so when he passed in 1999 I was able to deal with that in a positive way. We talked a lot before he died. In between the passing of my parents I lost so many close loved ones, mainly my elders. I am left with one uncle. 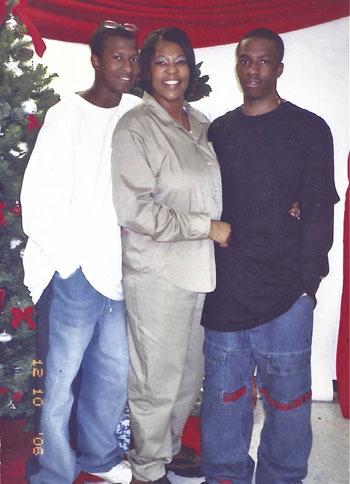 After coming to prison my mother had several heart attacks and a stroke. I thought she was getting better but a year before she died she said she would let me know if she was dying. We spent the last year of her life on the phone talking almost every day. Losing her in 2006 was extremely painful because we shared a love for God that no one else in my family did. My mother was my inspiration. She raised me in the church so once I got locked up I returned to God to sustain me. However when I lost my brother that did me in. He was the youngest and I never thought that he would die at such an early age. In 2009 I had a heart attack. I have suffered with high blood pressures since the pregnancy of my first son. I have had asthma since I was three, along with allergies. Due to an accident just before coming to prison I have problems with my knees and now my foot. My sons father was abusive. Just before getting locked up the abuse stopped because I started fighting back. Today I can say that I am much stronger than I was. I have gained my independence. I am focused on improving myself, my self-esteem, and have developed many skills. I’ve received a certificate in Business with legal application using college credits. A certificate in Wedding Consultant. An Apprenticeship in Office Administration Assistance, also one as a Chaplain Assistance. I have numerous certificate from Parenting to Performing. I have taken almost every class that has been offered in the system, and Correspondence courses as well. I co-wrote a Proposal and had it approved by the Warden to speak with the women upon entering the prison, encouraging them to stay positive and out of trouble based on my own experience. I have maintained clear conduct for twenty years. That is only by the grace of God. My strength comes from Him. I have volunteered in the Chapel since I was sent to Danbury. I directed the Choir almost my whole time in Danbury. I have written, directed, and acted in several plays I’ve done. I have organized programs for the Chapel and the Recreation department. I also assisted the Warden with her program “Act of Kindness”. I don’t have any fines so if I am fortunate enough to receive clemency, I will not be in debt and will have the support of my family to assist me with re-entry, and rebuilding my life anew. I yearn to participate in making not only my life but the lives of everyone I touch better because I will never take freedom and all its luxuries for granted. I will embrace every day as if it is a blessing. 45 queries in 0.136 seconds.